Children are inquisitive by nature which means accidents around the home do happen. Small things such as leaving toys lying on stairs and kitchen doors open can cause unwanted accidents. Your retirement home might be equipped to deal with your needs in retirement but if you plan to have your grandchildren visiting regularly you might need to make a few alterations to ensure their safety.No home can ever be 100% child-proof but there are measure you can take to improve its safety. 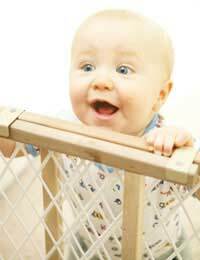 There are a number of immediate steps you can take to child-proof your home. Fitting child-proof locks on the cupboards where you keep your cleaning products and medicines ensures that children don't swallow or come into contact with dangerous chemicals. For younger children you should install gates across the entrance to your kitchen and stairs, or any other rooms you might consider potentially dangerous. For you and your grandchildren's safety you should also check your smoke alarm and carbon monoxide alarms regularly. Make sure that beds and chairs are kept well away from windows so children can't climb on them and try to get outside. And put all of your sharp knives, razors and kitchen appliances in a door with a child-proof lock. Large furniture is often one of the most hazardous obstacles for children, chair and table ends can lead to bumps and bruises. Rubber guard for the corners of chairs and tables are readily available and can easily be taken off when your grandchildren leave. Everyday objects such as ornaments and tablecloths can also cause problems. Anything that children can pick up or pull an lead to unwanted accidents. You don't need to rid your house of every ornament but perhaps move themfurther away from the edge of your cabinets so they are not easily in reach. Small parts in toys and games can be choking hazards and what might look like a harmless teddy or doll might not be suitable for your grandchild, so be sure to double check what age the toys are meant for. Fire is one of the biggest killers in the home, as well as having a smoke alarm there are a number of preventory measures you can take to protect your grandchildren. Don't ever leave children unattended near a fire and keep matches, candles and lighters in a locked cupboard that is out of reach. You should also make sure any open fires or heaters have a guard in front of them. Don't put toys in front of fires/heaters and don't let children play in the kitchen when you are cooking. It is rare for children to get electric shocks from playing with electrical equipment, but to be on the safe side you should switch off all electrical appliances when they are not in use. There are also a variety of socket covers available, some in the shape of animals, which can be fun for children. If you have any old electrical appliances it is a good idea to get these checked out and if you are in doubt throw them out. The garden is a great place for young children to run around and explore, but it can also be fraught with danger. Ponds are the biggest danger in the garden, so make sure any ponds are covered up from children. Greenhouses can also be potentially hazardous. A simple fence around the greenhouse can prevent children from falling into the glass and being harmed. Sheds should also remain locked and things such as spades, plant feed and compost should be kept in there when grandchildren come to visit. It's a good idea to keep children away from the bathroom as much as possible. Slippery surfaces and soaps and shampoos can prove dangerous for youngsters. Before your grandchildren visit you should try and put shampoos, soaps, razors and creams in an overhead cabinet so they are out of reach. Bathroom floors should be dry and the toilet seat down with any bath water luke warm, not scorching. Child safety does not need to be complicated. A few small alterations to your home can make it safe for your children. One of the best precautionary measures you can take is to stay observant and never let your grandchildren out of your sight, you will know your home better than them so you know where the dangers lie.